In February the UK Ministry of Defence (MoD) approved £1.7bn to upgrade Scotland’s military bases. The work is part of a wider programme that will bring sweeping changes to the MoD’s Defence Estate around the UK. Claire Apthorp found out where the money is going and what capabilities it will support. Scotland has long been a central component of the British armed forces’ naval capabilities. Image courtesy of UK MoD. The industry has played a long-standing role in cementing Scotland as a key naval location. Image courtesy of Defence Images. Key technology for the Typhoon aircraft is also under development in Scotland. Image courtsy of Defence Images. Announcing the investment as the MoD’s Defence Board convened in Edinburgh for the first time, Defence Secretary Michael Fallon said that the funding recognised that Scotland – including its 14,000 military regular and reserve personnel – plays a unique role in UK national security. Scotland has long been a central component of the British armed forces’ naval capabilities, with HM Naval Base Clyde forming the Royal Navy’s main presence. Clyde is home to the core of the submarine service, including the nation’s current nuclear deterrent, the Vanguard-class submarines, the future Dreadnought class, and the new-generation Astute-class attack submarines. The navy’s Armaments Depot, located eight miles from Clyde at Coulport, is home to the storage, processing, maintenance and issue of key elements of the Trident missile system, and ammunition maintenance for all submarine weapons. The industry has also played a long-standing role in cementing Scotland as a key naval location, providing and maintaining critical engineering and technical expertise for the building and maintenance of Royal Navy equipment. The two biggest vessels ever to be built for the Royal Navy – the Queen Elizabeth-class aircraft carriers – are currently in construction by BAE Systems and the Aircraft Carrier Alliance at the Rosyth Dockyard. BAE Systems is also building the navy’s River-class Batch 2 Offshore Patrol Vessels at its Govan shipyard in Glasgow, and the Type 26 Global Combat Ships at the Govan and Scotstoun yards. Under the funding announced in February Scotland’s naval identity will be preserved with £1.3bn to be invested into HM Naval Base Clyde’s facilities as it prepares for the arrival of the Dreadnought class submarines from the early 2030s. Work will include enhancing the base’s waterfront, engineering support capabilities, accommodation and physical security measures. Funding of £400m will go toward Royal Air Force (RAF) base Lossiemouth. Lossiemouth is a fast jet main operating base, with both Tornado and Typhoon squadrons based there, as well as the main training facility for pilots and weapon operators for the Tornado GR4. Having absorbed 6 Squadron, 1 (Fighter) Squadron and II (Army Co-operation) Squadron in 2014 and 2015, Lossiemouth is now also responsible for maintaining Quick Reaction Alert (Interceptor) North duties for the RAF, providing crew and aircraft at high states of readiness 27/4 to police UK airspace and intercept unidentified aircraft. Key technology for the Typhoon aircraft is also under development in Scotland, with Leonardo building the CAPTOR-E active electronically scanned array radar system – the future primary sensor for the aircraft – in Edinburgh under a €1bn deal that secures around 500 jobs in the area. The Lossiemouth base will also be home for the nine P-8 Poseidon Maritime Patrol Aircraft on order for the Ministry of Defence. 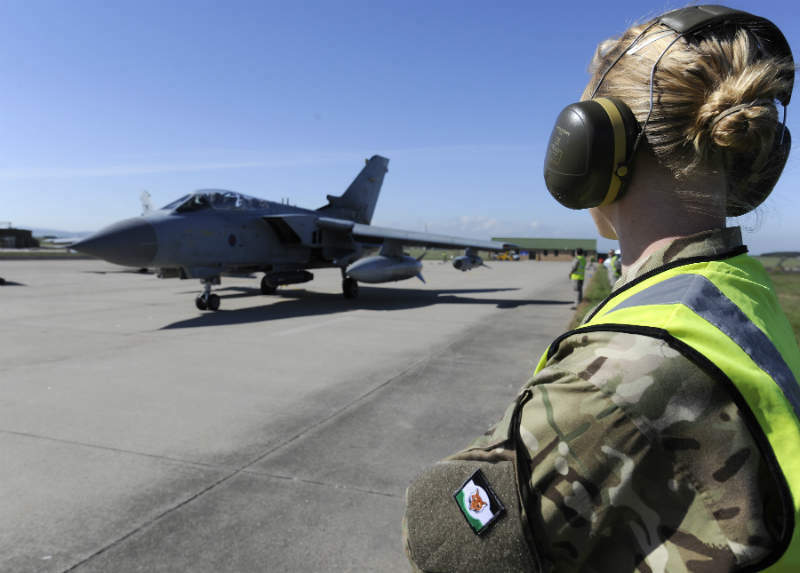 The £400m investment in the base will go toward upgrading runways, taxiways and accommodation for aircraft and crew to reflect the base’s growing role. British Army activities in Scotland will have a new home under the funding, with former RAF base Leuchars Station, which was handed over to the army in 2015, set to become the central hub for army operations. Leuchars is not the only army facility in the UK that will be expanded and upgraded over the coming few years. As part of a wider project known as the Army Basing Programme, the MoD announced as part of its 2010 Strategic Defence and Security Review that it would rebase the remaining British Forces Germany brigades back to the UK by 2020. Current timescales will see the final Field Army units, including elements of the 20th Armoured Infantry Brigade, withdraw from Germany in 2019. It is estimated that drawing down the remaining troops from Germany will produce savings up to £240m per year, and £1.8bn has been committed by the MoD to improve army infrastructure across the UK to accommodate the troops and their families, along with the technical and training infrastructure. At the same time, the MoD is running its £4bn Defence Estate programme, under which it is rationalising sites across the UK and investing in a ‘better built’ estate that will better meet the needs of the armed forces. Currently, the UK defence estate is “too big, too expensive, with too many sites in the wrong locations,” according to the Secretary of State for Defence. The estate covers 424,000 hectares – around 1.8%of the UK’s land mass; and 40% of assets are more than 50 years old. In total, 91 of the most expensive sites around the country will be sold off. Scotland has not escaped the axe, with eight bases across the country to be closed by 2032. Under the plans, by 2040 the estate will be 30% smaller, with capability based around new centres of specialism with better infrastructure that can be utilised more effectively to meet the needs of Joint Force 2025. The investment to make HM naval base Clyde the home of all the UK’s submarines, as well as the development of RAF Lossiemouth for the new P-8 maritime patrol aircraft capability, are critical steps to achieving these goals, but commentators remain divided as to whether the overall change to Scotland’s military infrastructure and identity will be a positive or negative one.